The College of Wooster’s only literary magazine, The Goliard, holds the significant role and responsibility as a creative outlet for the student body’s literary and artistic talent. Begun in 1989 and publishing its first issue in 1990 under advisor and English Professor Debra Shostak, The Goliard is on the brink of becoming the College’s longest-running student-run literary magazine — a testament to both its staff and the student body’s creativity. After Thistle died out in 1983, the College went six years without a literary magazine. The arrival of English Professor Daniel Bourne (a poet and the founder of Wooster-based literary journal Artful Dodge) and his promotion of creative writing brought to light the need for a publication comprised entirely of creative works by Wooster students. The Goliard accepts submissions in all mediums of creative expression, from poetry, to painting, to music. “We publish anything creative and of quality,” said Editor-in-Chief Aaron Winston ’14. Winston and Maxim Elrod ’15, public relations representative and music editor for The Goliard, have worked throughout the fall semester to broaden the magazine’s sphere of influence in the campus and local community. Earlier this semester, they revived Covers — an event which had died out early in the fall of 2012 — where students perform covers of songs based on a theme. “A lot of people expressed a desire to have that back on campus as a part of student life,” Winston said. 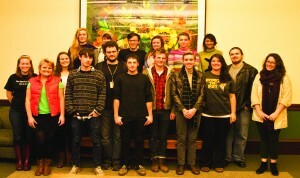 Covers is only one of their various efforts to foster a creative community on campus, in addition to hosting the occasional writing workshop. Elrod added that they’re looking to use local businesses like Spoon Market and Lucky Records for open mic nights, where students could read poetry or perform music. Winston emphasized the significance of a literary magazine on a college campus. Winston thinks of The Goliard’s goal as twofold: first, to provide an accessible platform for creative expression on campus, and second, to give students a resume of past experience in the publication process. “We exist to serve the student body,” Elrod said, echoing Winston’s sentiments. The staff of The Goliard wants students to feel comfortable submitting their work and potentially sharing it with the campus and the local community. “We don’t exist without the student body,” Winston said. The magazine and its 21-person staff use a blind review process, so those students who are more self-conscious of their creative work can submit worry-free. The Goliard will soon be publishing its belated 2013 issue. For more information or to view work from the 2013 issue, visit www.goliard.spaces.wooster.edu or The Goliard’s Facebook page.